The first verbal commitment of the Carol Capitani era at the University of Texas will be Tasija Karosas, a big-time backstroker from the St. Andrew’s School in Boca Raton, Florida. There she is coached by Sid Cassidy, a heavyweight in the global swimming community as a member of the FINA Open Water Technical Committee. Karosas has backstroke bests of 53.45/1:56.33 in yards, which will make her the future of a Texas backstroking group that was thinned out last year by transfers. When Karosas comes to campus next fall, Lily Moldenhauer will be a senior, as well Arizona transfer and All-American Sarah Denninghoff. Karosas swims for a St. Andrew’s squad that placed 3rd at the Florida 1A State Championship meet last year, including a win in the 200 free relay with four underclassmen. In that relay, they took down the mighty Bolles. Karosas was also the State Champion individually in the 100 backstroke, and was 2nd in the 200 IM. That IM as an indicator of her versatility, with a 2:01.5 best. She’s also been a 55 in the 100 fly and a 1:48 in the 200 free. 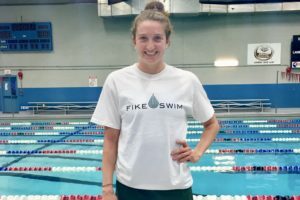 CollegeSwimming.com rates her as the top recruit out of the state of Florida in this year’s senior class. This is an excellent start for Capitani in a class where she will need to start digging up a lot of depth, as most of the Longhorns’ big scorers are graduating in the next two years. A small class last year left Texas a bit thin, including major needs in the butterfly and breaststroke groups as well. Nice catch for Carol and Roric! Big commitments today. Olivia Smoliga to Georgia. Leah Smith and Kaitlyn Jones to UVA. Congrats to all programs.